What are raised panel cabinet doors? 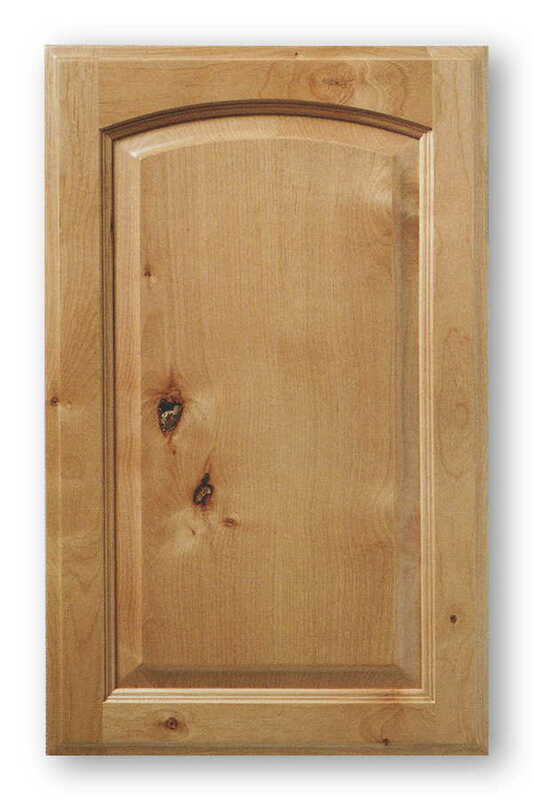 Raised panel cabinet doors are defined as typically being built in 5 pieces. 4 pieces of wood for the frame of the cabinet door, and the 5th piece being the raised panel itself. 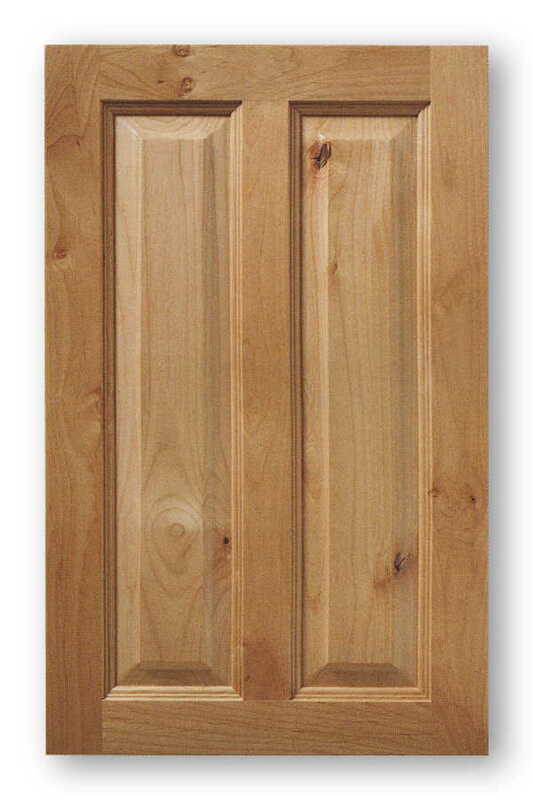 Raised panel cabinet doors have been around for centuries also called frame and panel doors. Long before the strength of modern woodworking glues and adhesives, doors and cabinet doors were assembled with no glue at all, usually the joints were doweled to hold them together. As we can see from our wonderful historic homes and building this method of cabinet door construction has been tested over time and has proved to be one of the best ways to construct cabinet doors. 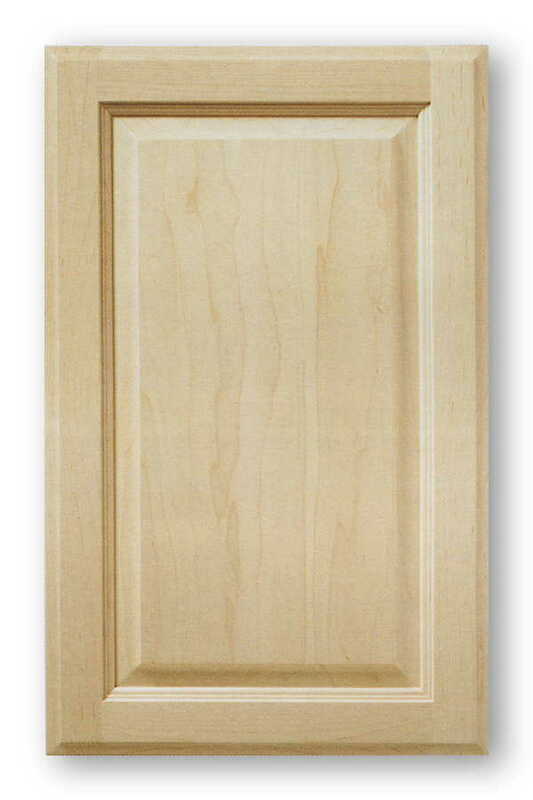 The raised panel cabinet door has a center panel that is “raised”. All that means is that the edges of the wood of the panel are cut or raised to fit into the grooves of the cabinet door frame. Historically this “raising” of the cabinet door panel was done by hand usually with a hand plane, sometimes very crudely just to get the panels edges to fit into the grooves of the cabinet door frame. Some early craftsmen placed the back side (flat side) of the raised panel door, out to the showing face of the cabinet or furniture they made, leaving the planed raised panel edge on the inside of the cabinet where no one would see it, exposing only the flat side to the room. As hand planes became more complex actual planes were developed to cut a more consistent raised panel edge where the raised panel could be displayed more proudly, showing off a crisper raised panel detail. Since the advent of large powerful rotary shaping equipment shaping of the raised panel door has become more simplified over the hand plane of yesteryear. Modern shaping equipment is much faster and produces consistent results. The combinations of raised panel cabinet doors are virtually endless. Doors can be produced as a standard raised panel door, as well as with an arch or cathedral arch top. 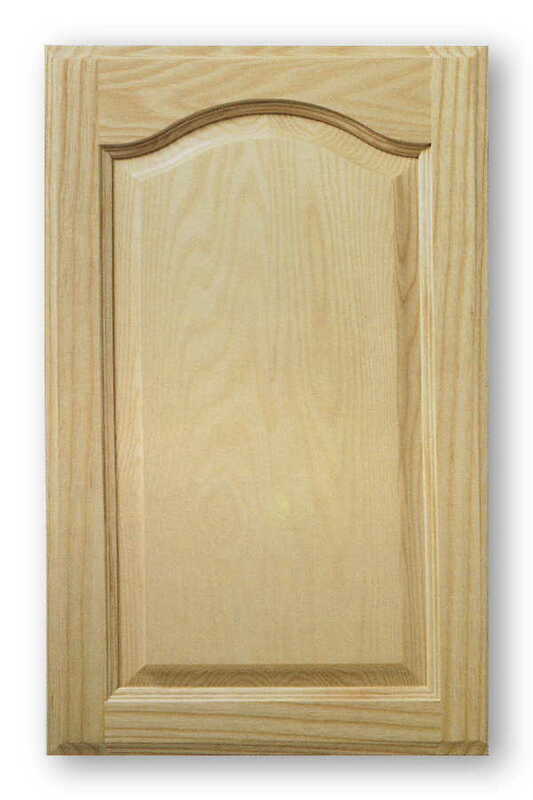 Raised panel cabinet doors can be made in just about any wood, as well as composite materials such as MDF. 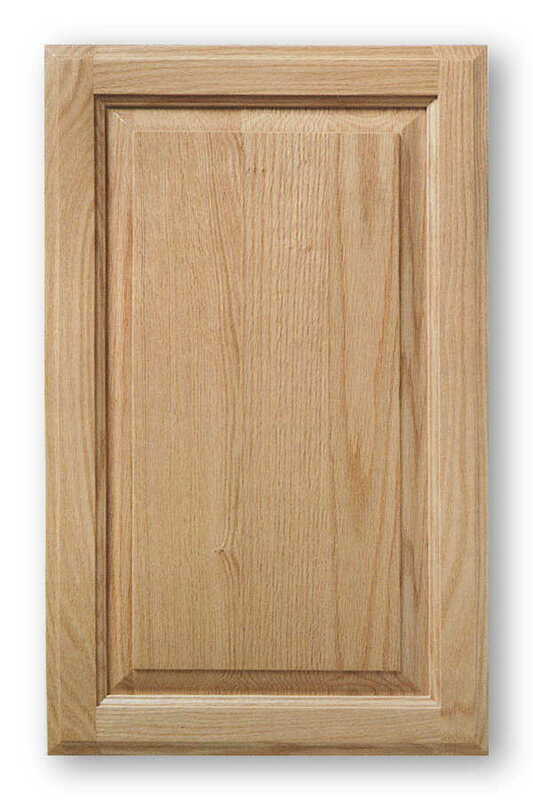 Raised panels can be made into wainscoting or cabinet end panels, to give your cabinets a classier appearance. There are additional combinations such as multi-panel cabinet doors, as well as single and multi-panel applied moulding raised panel cabinet doors. Drawer fronts can also be produced in a raised panel design. One thing to keep in mind that raised panel drawer fronts will have to be tall or high (vertical dimension) enough to allow a full panel without losing the center flat portion of the raised panel. Typically this minimum height is 6″ to allow for a aesthetically pleasing front as well as providing a large enough flat area in the center of the panel to place a handle or knob. Are Painted Raised Cabinet Doors Still Attractive? The question is rather simple, are painted raised cabinet doors still attractive in a kitchen? Yes this style may very well be familiar to you and this may create an idea in your mind that it is not modern enough or pleasant enough to look at, but if you choose the correct style along with the correct type of finishing there is no reason why your new cabinet doors cannot be very attractive to look at. Before going into more detail as to why this is the case we need to first of all talk more about the actual design itself. 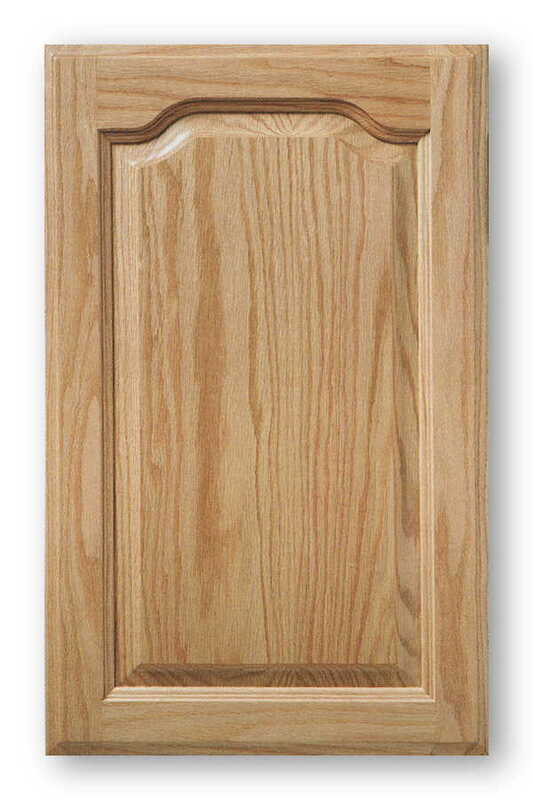 As the name suggests this is a type of cabinet door that has a raised panel and this panel will be in the central part of the door, but do not worry about a potential lack of options because in all honesty there are several designs that you can choose from depending on the finished look that you are trying to achieve. With the panel you can simply have one single panel in the middle that breaks up the plain door that is made from a single piece of wood. This is the simplest form of this design, but there are others that are more ornate that may be more attractive to you. These more ornate patterns will include things such as beading to frame the raised panel, the edge of the door may be raised followed by a sunken part then the raised panel in the middle, the raised panel may be angular, or other designs will make the raised panel sharper resulting in a crisp design that could be seen as being more modern and less fanciful than other options. When it comes to having them painted, then obviously the final choice is entirely up to you and the look that you are trying to achieve with your kitchen. Colors such as white, cream, or even what is classed as off-white meaning a hint of another color is added to take away the sharpness of the pure color, can work brilliantly and indeed this lightness is often better than going for a dark color unless you have the amount of natural light that can make a dark color really pop. Do just remember that a light color will work better in a smaller kitchen due to how it will create shadows in the panels as well as reflect the light around the room making it feel bigger than it actually is. Painted raised panel cabinet doors are certainly still attractive and indeed they are perfect for so many styles of kitchens from modern to the more traditional look. Your main concern, apart from the color, has to be the style of panel that is on the door and it does mean that you need to look at various styles and think carefully about they would work in your very own kitchen. Look at images, get some advice from experts, and ultimately choose a color that makes the rest of the room easy to decorate and you will finally be able to have a kitchen that you not only love, but is perfect for entertaining guests. What are raised panel cabinet doors? 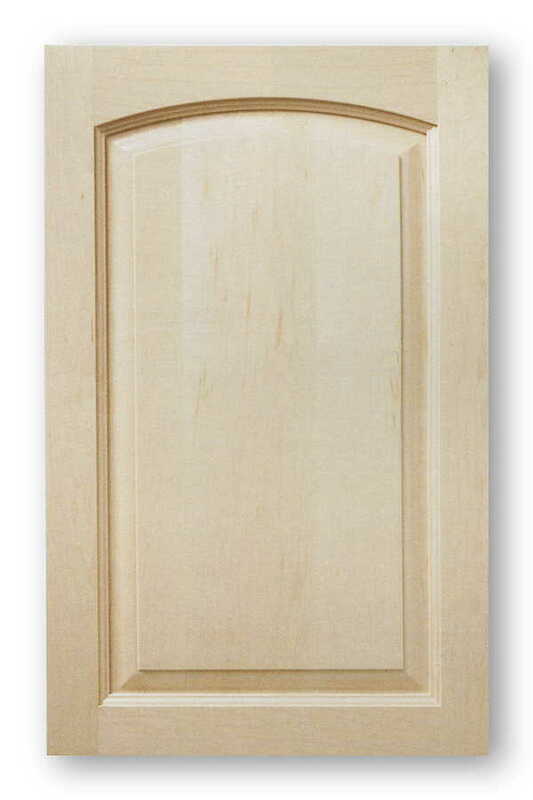 Raised panel cabinet doors are defined as typically being built in 5 pieces. 4 pieces of wood for the frame of the cabinet door, and the 5th piece being the raised panel itself. 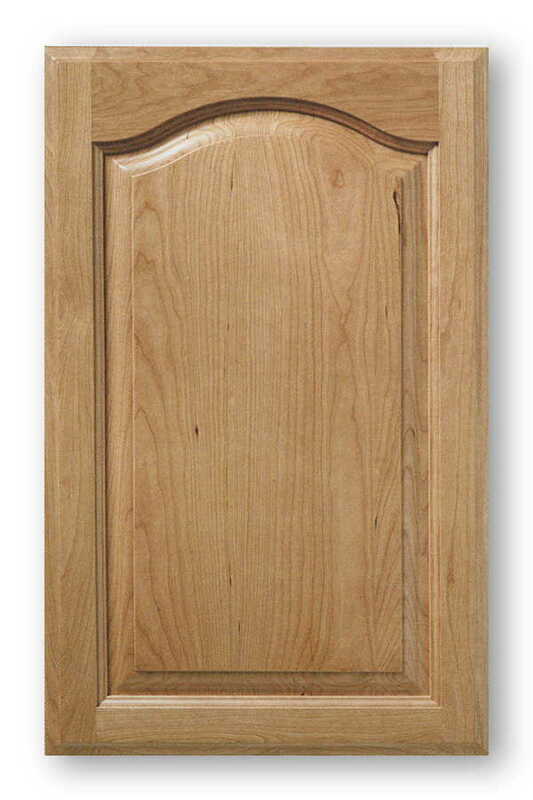 Raised panel cabinet doors have been around for centuries. Long before the strength of modern woodworking glues and adhesives, doors and cabinet doors were assembled with no glue at all, usually the joints were doweled to hold them together. As we can see from our wonderful historic homes and building this method of cabinet door construction has been tested over time and has proved to be one of the best ways to construct cabinet doors.